For this episode, more about your favorite hip-hop podcast brings you a mini-edit of DJ Dub’s new mixtape: Little Brother – Good Clothes. I think I’m pretty much preaching to the choir here, capsule but on the off chance you haven’t heard of Little Brother, then this should give you an idea. 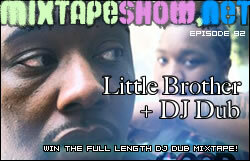 But beyond that, we’re doing a giveaway for the full-length DJ Dub mixtape (full tracklist here). If you want a copy, all you need to do is drop a comment with what you think would be an interesting collab between LB and any other artist. Extra credit if you can explain why/make it funny or interesting, and first come first served. Details in the episode itself, so listen! Interlude – DJ Dub and Phonte – Lil Wayne ?! links: DJ Dub, Little Brother, Carlitta Durand, Chaundon, Dwele, 9th Wonder, Joe Scudda. So that’s it – let the comments fly. I’ll post a notice when I’m out of CDs, first come first served. And if you aren’t in the facebook group already, better join now – I give away all the good stuff in there first.